It’s a pity that the T20 format doesn’t allow for a longer, spaced out battle. Individual match-ups though still play a part in the game, according to some analysts. 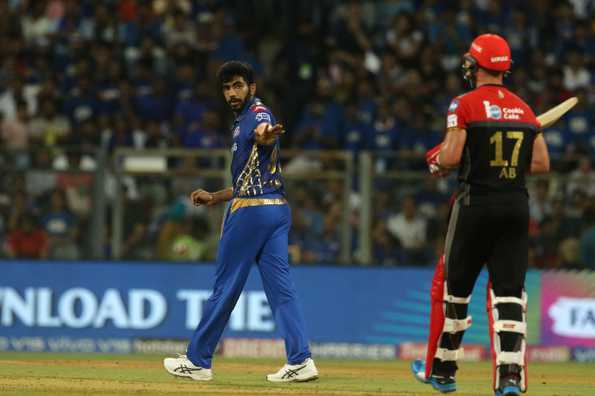 And going into this particular game, Jasprit Bumrah had dismissed AB de Villiers and Virat Kohli twice in the IPL. His match-up against Kohli, also a part of the promotional strategy by the broadcasters, had turned out to be as exciting as the build-up in the first game. Taken apart in his first spell then by Kohli, Bumrah returned to bounce Kohli out and turn the game in Mumbai’s favour. There wasn’t a sequel to that battle today, for Kohli was dismissed early. But there was the other one, the one that didn’t make it to the ads, but possibly even more riveting. The one between Bumrah and de Villiers. It lasted only 15 balls, yielded only 17 runs and the bowler did not come close to dismissing the batsman. And yet, there was enough to savour. If anything, it did not last long enough. When he came in first, de Villiers was up against Bumrah with a newer ball, which was zipping quick off the pitch. And Bumrah, was trying something different. The arm was still starting from long off and finishing towards fine leg, but the ball was not going in to de Villiers, as he seemed to expect. Twice in two balls, the batsman was caught defending and missing as the ball moved out. The third came in and hurried him up, hitting him on the inside edge and rolling past the leg stump. It was a set-up straight out of a Test match. He would go on to beat him once more in the next over. But this wasn’t a Test match, and de Villiers was definitely not going to see the spell through, so to speak. So when he found width, the South African slashed and found the boundary. Those were the only runs Bumrah would concede in his first two overs, in the powerplay. When he returned to bowl, it was at the other end of the innings, with de Villiers still out there missing, miscuing and yet scratching his way to a fifty. And this time he was up against a Bumrah with a different set of plans. Now, he packed his onside with four boundary riders from fine leg to long on, the areas that de Villiers loves to target through his variety of scoops and lofts. That field also dictated that he bowl straighter, and different from his opening spell. And de Villiers had his eye in now and was ready to counter the plan. A missed yorker was drilled between cover and mid off, which was repeated again next ball even when Bumrah got it better. Not to be outdone, Bumrah replied by nailing the yorker first and then firing in a ripping bouncer to crash into the side of de villiers’ helmet. For moments, there was stunned silence as fielders gathered around to check on the batsman, and the physio rushed out to check for concussion. It also turned out to be the anti-climactic end to a battle that seemed to be only warming up. It would take AB de Villiers to come out of his international retirement for a chance to see a longer battle between arguably the generation’s best batsman, and a pacer pushing to be the world’s best. And de Villiers has made it clear, on multiple occasions, that he isn’t going to be coaxed into such a decision. So much so that he jokes about journalists not asking the question anymore. It’s a pity then that the only possible battle between the two will come only a year later when the IPL comes around and can, at the very best, last only 24 balls. But while they were there, the two produced just a taste of what the World Cup next month will be missing.